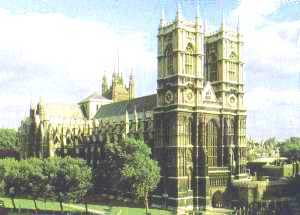 Work on Westminster Abbey began in 1042 when the Saxon King, Edward the Confessor took the throne. A strong Christian, he devoted 10 per cent of his wealth to the building of what was originally known as the West Minster. The original building was completed in 1065 and King Edward, later St Edward, was buried in it just ten days later. The Chapel of St Edward the Confessor (9) is today found in the east wing and it is considered by many to be the most sacred spot in the Abbey. Throughout the centuries the Abbey has continually been added to. For example the Nave (2) was added in the 14th century, Henry VII's Chapel (11) was added at the start of the 16th Century and the gothic twin towers were built as recently as the 18th century. As a result the Abbey is an architectural delight, with excellent examples of several styles of architecture throughout the ages. The Abbey is also historically very significant and it has strong ties with royalty. The first King to be crowned at the Abbey was William the Conqueror in 1066, and, with the exceptions of Kings Edward V (1483) and Edward VIII (1936), coronations have taken place there ever since. Since Henry III (1216-72), the Abbey has also been where most kings and queens have been buried. Most recently the funeral of Princess Diana was held at the Abbey in September 1997, although she was buried at Althrop, her family home in Northamptonshire. Aside from its fabulous architecture and strong royal associations, there is a lot for tourists to see at Westminster Abbey. As a result huge amounts of visitors visit it each year, making it one of the most visited Christian churches in the world. Westminster Abbey is one of only a handful of churches in England that are "royal peculiars". A royal peculiar is a church that is managed by a dean who answers solely to the sovereign and not to any bishop or archbishop as is normally the case. The main sites inside the Abbey that you should look for include the Coronation Chair (8), which dates from around 1300. This oak chair was the one that Edward I (1272-1307) sat in during his coronation and it has been used for most coronations since that date including Queen Elizabeth II's in 1953. The organ that was first played in the 1730s, the ornate altar built in 1897 (7) and the fabulous stained glass windows are also worth looking at. The Tomb of the Unknown Warrior (1) is to be found set in the floor just inside the main entrance to the abbey. The tomb and the poppies that surround it commemorate those who died serving their country during World War One. There is a Musician's Aisle (4) that remembers musicians who were connected with the Abbey and a Statesmen's Aisle (6) that commemorates past politicians and public figures. Poet's Corner (16) is where many of England's famous literary figures are buried or commemorated. And of course there are the numerous royal tombs and memorials that can be found all around the Abbey. If all this is still not enough, there is also a museum, 900-year old College Gardens (24), the cloisters and even a brass rubbing centre. Whilst you can still get a glimpse inside Westminster Abbey for free, unfortunately if you want a good look round you will have to pay an admission fee. Prices vary according to how much and which parts you want to see. Opening hours of the various parts of the Abbey also vary so do check times and prices before you go. Guided Tours are available on most days, or you can hire a portable taped commentary system. Both of these are good ways to see the Abbey, but your visit will be most memorable if you try to attend a service. Evensong is the best service to go for as it is held daily, admission to all public services is free.